Tangible and embodied technologies hold great promise for supporting exciting new forms of personal activity and social interaction. The computer is beginning to disappear into its physical and social surrounds. Examples of such technologies include physical computing (e.g., Arduino microcontrollers), geo-locational services (e.g., FourSquare or Google Glass), personal health technologies (e.g., Fitbit or Jawbone), and computer vision (e.g., Microsoft Kinect). People are connecting with each other and with their world in completely novel ways. The “maker movement” reveals a surge of interest in digital-physical interfaces that turn the physical world into a computer interface, instrumenting homes, clothing, and an infinite array of fabricated artifacts. At Encore lab, our research group is becoming increasingly aware and interested intechnologies that support tangible and embodied interactions. Amidst our shared intuition that technologies that support such interactions will become a fixture within our learning designs, non-trivial applications are still hard to find. We want to develop a better vision for the potential application of these media – what forms of learning they enable, and what kinds of design and development will be required. What will we be using 3D printers for (besides printing random trinkets to impress our friends)? What will the context be for learning? What learning activities, and what media will be involved? How might technology applications like computer vision, simulations, and physical interactions become part of our instructional designs? 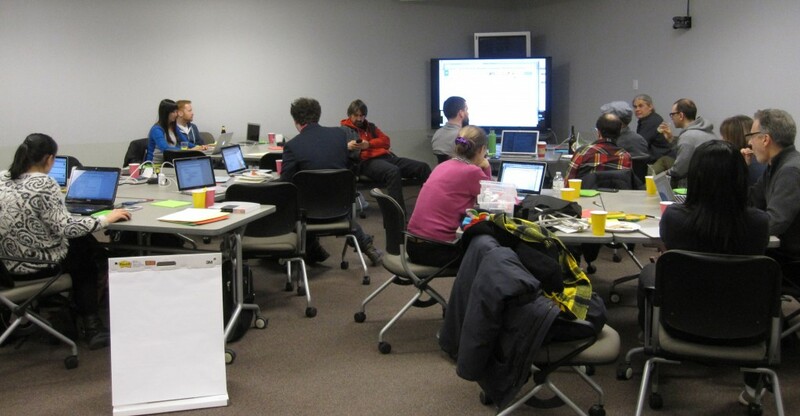 In November of 2013 we held a “design jam” where we invited colleagues who are interested in tangible and embodied technologies to participate in a discussion about applications that go beyond “hello world” interactions. After a general discussion, we broke into groups where we worked on three projects: a tangible idea garden, interaction web, and a light wall. Groups made progress on their ideas at our first jam and are continuing to work on designs as we gear up for our next “jam”. We are excited to see our ideas become a reality. We intend to use a rapid development approach, using open source frameworks like Processing and D3. Arduino, Raspberry Pi and even Makey Makey.